Biodiversity is critical to all sectors of the economy be it energy, tourism, Agriculture and health. It is also essential for supporting national efforts towards developing a green economy and attracting direct investment. It is for this reason that the Africa Biodiversity challenge (ABC) was instituted in 2018 by the South Africa Biodiversity Institute (SANBI) to encourage African countries to mobilize biodiversity data and produce information products that will inform government decision making process and policy. The prize giving ceremony of the inaugural African Biodiversity Challenge was held in Accra Ghana. 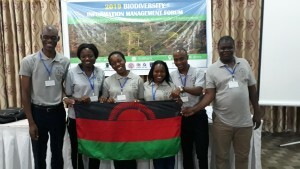 The Ghana team took the gold prize with over 23,932 biodiversity data mobilized on forest vegetation, food, crops, mammals, reptiles and pollinators. The Malawi Team was made up of representatives from National Commission for Science and Technology (NCST), Wild-life and Environmental society of Malawi (WESM), Museums and monuments (MoM) and National Herbarium and Botanic Gardens of Malawi (NHBG) won the silver prize after mobilizing 9,642 data on useful plants, birds, mammals, reptiles and pollinators followed by teams from Rwanda and Namibia who jointly won the bronze prize with 6,400 biodiversity data collected on mammals and 2,164 on invest water biodiversity plants and invertebrates.